When Walmart set up shop in a small West Virginia town, Foodland, a grocery chain of around 30 stores spanning areas of the south and southeast, buckled under the pressure. “It was just overnight. Even the employees didn’t see it coming,” said Pat McKenzie, director of the Richwood Chamber of Commerce. The neighborhood mainstay closed its doors just weeks after Walmart’s arrival. Piggly Wiggly, a larger chain with over 500 stores, followed suit shortly after. Walmart isn’t an under-the-radar threat. It speeds into town, horns blaring, and steamrolls any resistance it should face. If Foodland employees didn’t see it coming, they weren’t paying attention. Walmart is the threat we know, but Amazon is the one we should be paying attention to. Instead of total annihilation Amazon takes a more systematic approach. Its competitors aren’t left for dead; they’re instead forced to join Amazon’s ranks in a move that makes the online giant even more powerful with each corporate casualty. Amazon was founded by Jeff Bezos as a humble online bookstore. But in the years to follow, Amazon quickly evolved into the web version of Walmart, only on a much larger scale. Now you can find nearly half a billion products ranging from grocery items to sneakers. And as you’d expect, there have been casualties along the way. Originally Amazon was deemed an existential threat only to independent bookstores, then huge chains like Borders, which it forced out of business in 2011. There was Circuit City, which Amazon played a large part in dismantling after essentially turning it into its own showroom. People would touch and test products in Circuit City, only to make the actual purchase online, and typically at a significant discount on Amazon. All told, Circuit City shuttered 567 stores, and mostly due to pressure from online retailers. Amazon wasn’t done. You’ve got Good Guys, Tower Records, and countless other independent retailers you’ve probably never heard of. No business goes out of business due to one competitor. It’s usually due to a combination of factors. But the Amazon factor became a major factor in those businesses gradually going out of business, from bookstores to record stores to electronics stores. They are a category killer. Amazon could be the exception to this rule. Its effects are felt by everyone from Levi’s, to Sears, Nike, and yes, even Walmart — which plans to close 269 stores this year. For anyone that worries about Walmart, they should be losing sleep over Amazon. And it’s doing a damn good job. With 480 million products, it’s hard to even imagine an operation of this scale. 52 percent of all book sales happen on Amazon, 43 percent of all online commerce passes through the platform, and it owns 45 percent of the cloud computing market. Of every $2 spent online, nearly $1 is spent on Amazon. And worse, according to market intelligence firm Bloomreach, buyers are spending this cash without ever visiting another site. The massive operation could get even bigger in the coming years. Amazon has already expressed interest in selling cars, providing loans, pedaling prescription drugs, and handling your banking. And that’s just the tip of the iceberg. With more than 80 million Prime members in the US alone — a figure that has doubled in just two years — Amazon is quietly bringing the entire country into its ecosystem. Dash Buttons, Alexa, and free two-day shipping are the bait, and we’re the gullible fish that can’t wait to bite down. Once we’re in the ecosystem, all bets are off. If you’re already resigned to the notion that this isn’t that bad because it’s merely a marketplace, not a retail operation, I’d like to remind you about Amazon Basics. Take, for example, the average Amazon seller. Perhaps she’s the founder of a small three-person operation that leverages her skill as a widgetmaker. She creates an online storefront using Amazon’s platform, which puts her products in front of millions of online shoppers. As time passes, reviewers sing her praises (as well as that of her product), and sales skyrocket — forcing her to double her manufacturing capabilities, move into a bigger building, and hire additional staff. And them Amazon brings down the hammer. The next day she logs on to see her top-ranking product is now buried in on-site search, replaced by the same product brandishing an Amazon Basics logo. According to a study by The Capitol Forum, this is fairly common in the Amazon Basics line. Another study reveals it takes as little as three weeks for Amazon to cannibalize other sellers’ products, slap its stamp on them, and use its muscle to move its own line to the top of search results — all while undercutting other sellers. If you think this only impacts the little guy, you’d be wrong. Take Nike. Amazon essentially strong-armed the company into an online deal by promising to remove counterfeits from its platform. This, mind you, is something Amazon should have — if it had any integrity as an online marketplace — done all along. Nevertheless, Nike relented and Amazon is now pimping branded athletic apparel. Amazon reached a similar deal with Levi’s Jeans. And for those that don’t fall in line, there’s the cautionary tale of Hachette, one of New York’s largest publishing houses. The publisher boasts a who’s-who of notable authors, including James Patterson, Stephen Colbert, Malcom Gladwell, and J.D. Salinger. 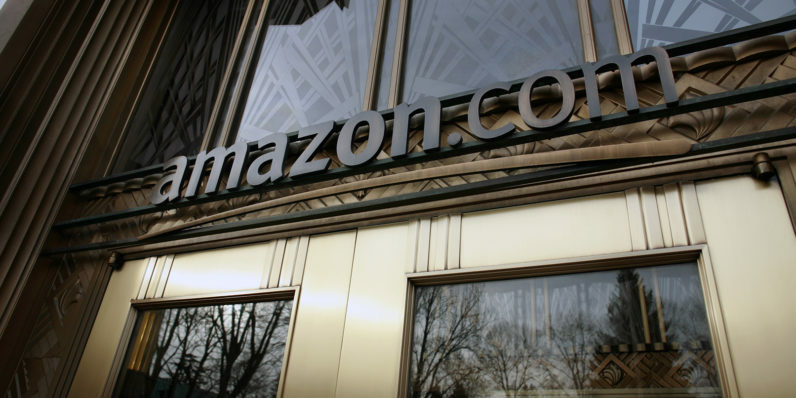 But even its stature in the publishing industry was no match for Amazon during a 2014 dispute. After failing to secure more favorable purchasing terms, Amazon essentially made thousands of books disappear from its recommendation algorithms. It also dissuaded searchers from buying by displaying messages that warned of two to four week waits for shipping. In the snap of a finger, Amazon — a company responsible for over 50 percent of book sales — made one of the world’s largest publishers disappear. Then there’s Macmillan. In 2010, Amazon removed the “buy” button from its entire library during a similar dispute. Two years later it did the same with over 4,000 titles from the Independent Publisher Group. But is it a monopoly? For all the fusion between the worlds of online and offline commerce, the two are still seen as separate beasts by the regulatory powers that be. While Amazon is making (relatively) quick work of online retailers, it’s hard to pin the closure of offline stores — like Borders, and Circuit City — on a single business and not a shift in consumer purchasing behavior. And because its latest acquisition doesn’t (at the surface) increase its dominance in the online space, the case for an antitrust violation becomes a bit murkier. Its acquisition of offline entities, like Whole Foods, aren’t going to be met with the same regulatory zeal as if it had purchased, say, eBay or Craigslist. Put simply, Whole Foods is an offline entity in a world that doesn’t — at first glance — make Amazon stronger. It’s a business Amazon wasn’t competing in previously with any real significance, and one that’s full of other large chains: Kroger, Walmart, Trader Joe’s, etc. But that’s only a surface look — which is unfortunately all most antitrust cases get. The reality is, the move does make Amazon stronger by strengthening its foothold in the offline world — enabling new ways to track offline users, widening its already impressive distribution network, and facilitating last-mile deliveries — which makes it stronger in the online world as well. On infrastructure alone, Amazon is now in line with FedEx or UPS — a development we could soon see play out as competitors are forced to use Amazon’s platform, and therefore its infrastructure, to facilitate online purchases. Any continued weakening of the two top shipping companies in the US makes a strong case for Amazon to pick up the slack, at its own terms. Where it’s easy to say a telecom, for example, wields too much power by kneecapping upstart competitors and controlling key infrastructure, Amazon’s lack of focus could be its greatest asset. Put another way, Amazon’s wide net approach has kept it, to date, from being large enough to worry about in any single market segment. Even one of its largest investments, Amazon Web Services (AWS), still controls “only” 45 percent of the market. Or there’s ecommerce; Amazon, for as large as it is, still “only” controls about 43 percent of online sales. Courts look at the firm’s market share, but typically do not find monopoly power if the firm (or a group of firms acting in concert) has less than 50 percent of the sales of a particular product or service within a certain geographic area. Some courts have required much higher percentages. … Judging the conduct of an alleged monopolist requires an in-depth analysis of the market and the means used to achieve or maintain the monopoly. Obtaining a monopoly by superior products, innovation, or business acumen is legal; however, the same result achieved by exclusionary or predatory acts may raise antitrust concerns. … For instance, the monopolist may be competing on the merits in a way that benefits consumers through greater efficiency or a unique set of products or services. By this definition, Amazon doesn’t seem to qualify as a monopoly — although the “exclusionary or predatory acts” clause seems to at least be worthy of investigation. And it’s worth noting that current antitrust laws were written well before the dawn of online retailers . At the end of the day, Amazon’s classification as a monopoly (or not) is irrelevant. Its monopolistic powers will continue to wreak havoc on commerce, regardless of what we decide to call it. It’s not clear where it stops, but Jeff Bezos is hoping that added convenience keeps you, the consumer, from noticing just how far Amazon’s roots are spreading. This is problematic for many reasons, but the power this sort of dominance creates is enough to cripple multiple segments of the US economy, if not the whole thing — if left unchecked. Strong-arming publishers is one thing, but Amazon’s power doesn’t stop at mitigating loss due to terms it deems unfavorable. Take, once again, the Whole Foods deal. Amazon’s immense stature reportedly allowed it to compete with no one in the acquisition — Amazon threatened to pull out should Whole Foods entertain other bids. And at the end of the day, the $13.7 billion acquisition ended up essentially amounting to a freebie once you consider the increased stock price — $13.4 billion added to company coffers — after the news broke. Maybe none of this matters. Maybe all that matters is Amazon has built a business that offers unparalleled convenience, pricing, and the biggest leap forward in commerce since the advent of fiat currency. For the consumer, nearly everything else is secondary. But for all the talk about how Walmart upends local economies, it’s strange we aren’t making the same noise about a company that’s on pace to dominate global commerce in the next decade. If you’re looking for an easy fix, I’m not sure one exists. As digital consumers, we’ve embraced the age of the mega-corporation, and all the convenience it brings through lower prices and superior efficiency. But Amazon isn’t acting in a bubble. We’re quickly handing over an immense amount of control to the world’s largest companies, and with it we’ll have to accept the economic consequences that come with it. Or, maybe we can start treating these businesses like we would their brick-and-mortar counterparts: like a monopoly.